I just have to say sorry to you all today for it being such an off day. I think being tired my brain, my eats and my posts are not as fun. Tomorrow will be better for sure ~ promise. We will be over the hump and I WILL get some sleep. I just realized I never posted any of my snacks for you today. My midmorning snack was a little bit of crunch and another dairy serving. 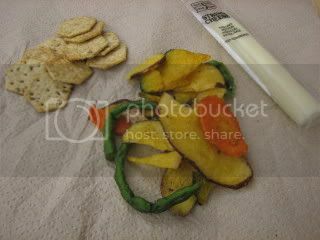 I had a Trader Joe’s Lite String Cheese with some crunchy “veggies” that we bought at The Vegetable Patch over the weekend. I had portioned out some Trader Joe’s Wheat/Flax crackers but decided to trade them in for more veggies. 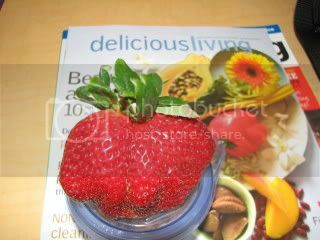 My afternoon snack was a huge organic strawberry that my co-worker gave me pictured below and a small handful of cashews (not pictured). The Husband came home later than planned from playing poker so I pretty much ended up spoiling my appetite for dinner. I snacked on first some Doritos (leftover from yesterday). I swear I never keep chips in the house because I WILL always go to eat them. 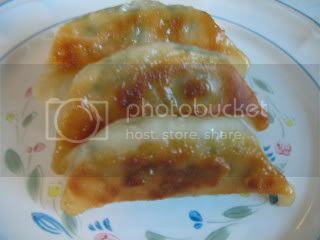 Then, I decided that I was craving some shrimp so I had a few of the Trader Joe’s Shrimp Gyoza we had in the freezer. You know, these were not bad, but, I think I definitely prefer the veggie and chicken versions. After being lazy on the couch watching The Food Network, I figured I best get my bootie goiong on dinner. For dinner tonight, I was inspired by my latest Edition of Clean Eating Magazine. The soup of the cover looks amazing. I thought of making it as is, but, then, The Husband said that Collard Greens always include sausage and spice. Yes, I took a 5 ingredient recipe and made it into a bazillion ingredient recipe trying to use up the fridge. So, here is my version. Preheat the olive oil in a large soup pan. Add the sausage, onion, bell peppers and garlic. Cook until browned and carmelized ~ 5 minutes. Add the vegetable broth, water and collard greens. Bring to a boil. Reduce heat, cover and simmer for about 15 minutes. Add the potatoes, tomatoes and seasonings and cook another 10-12 minutes until the potatos are tender. 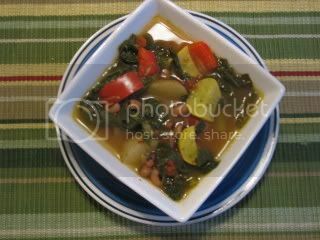 Add the black eyed peas, summer squash and anything else left off this recipe and cook another 2-3 minutes. Here is the portion I scooped out for myself, about 1.5 cups, but, I am STILL too full to eat it. I’ve had about 5 bites to taste it. I may or may not finish it though since I am trying to listen to my body and eat because I am hungry, not because it’s there. I am really glad I added the smoked sausage based on The Husband’s recommendation – it really added a nice smokey flavor and you get a good punch when you bite into one. 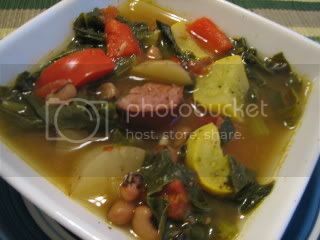 The soup is so flavorful, you can taste the carmelized onions and the collard greens. I bet it is even better tomorrow (guess what is for lunch?!) The Husband loved it and had 2 bowls. He had is with some Rosemary Potato Bread and said it is worthy of 4 out 5 stars, not bad. Alright ~ off to relax, watch The Rocker and do some Yoga. I’ll be back tomorrow refreshed and ready to go! « Not a "photogenic" lunch.